Many Italians, including workers, who after years of increased exploitation under both Right and Left governments, listen to his siren calls that all their problems are not really down to the failures of the capitalist system. They are all down to migrants, or the Roma or Sinti minority. Tweeting like Trump, he spreads false news in order to gain maximum publicity for his campaign to boost his support amongst the fascistic right. Asserting that that the “good times are over” for migrants who supposedly stay in 3 star hotels and get 40 euros a day (in reality they don’t stay in hotels except in some transit situations and the amount they get in euros is just enough to buy a packet of cigarettes) he portrays himself as the only one to fix the migrant crisis. In fact the number of migrants to Italy had already decreased enormously thanks to a dirty deal the previous (centre-left) Democratic Party (PD) had done with the Libyans. This reduced migration across the Mediterranean but condemned asylum seekers and refugees to slavery in North Africa. Salvini does not acknowledge this, or the fact that the “crime wave” he is going to solve has been falling in Italy for the last 2-3 years. In fact there is as much continuity as change in his migrant policy. And his racism does not stop with recent arrivals. His next easy target has been the Roma? and Sinti people who he accuses of all kinds of crimes. He called for all of them (there are between 100,000 and 200,000 in Italy i.e. less than 0.3% of the population) to be registered, echoing the race laws of the late Fascist era against Jews which were a preparation for their deportation to the death camps. Salvini later appeared to back down on this in the face of widespread hostility but still announced his disappointment that at least half of the Roma and Sinti have Italian citizenship so he “could not get rid of them”. Our Italian comrades in the Internationalist Communist Party have already written a longer article on the racism of the League, which we will translate next, but the one we have translated here underlines the fact that the same continuity can be seen in the new government’s policies towards the working class. Aside from the pun(1), there is little to joke about in the character who would prefer all migrants drown rather “soil” Italian land when the real problem is not migrants but the capitalist crisis. Two aspects in particular stand out. The first concerns the blindness typical of a convinced racist who, in order to gain popular support, passes off the recent “agreements” with the other European states as a 70% victory, when everyone – from Macron to Merkel – refused to accept more refugees alongside Poland and Hungary and the other Eastern European countries. 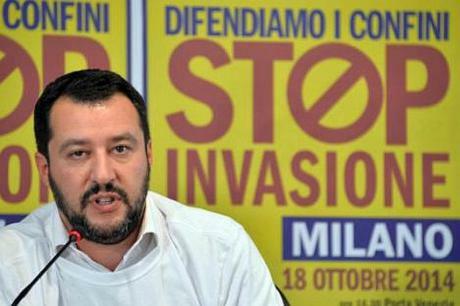 The second, much more serious, is that Salvini forgets, like all Italian politicians on the Right or Centre-Right (the Left have not been around long enough), that the cause of these biblical exoduses is Western imperialism, in which Italy plays a part, albeit in a secondary role. Mass exoduses began in 2003, after the American attack on Iraq, and the birth of the first jihadist formations, including Isis. They continued after the invasion of Libya (by France and the UK with first the approval, and then military support from the US) which increased flows across the Mediterranean. In the same year (2011) the attack on Syria completed the picture. Millions of unfortunates have fled from the devastation, death and criminal arrogance of imperialism. This is an amnesia that looks more like the obliteration of a social crime. Now those who are fleeing hunger and misery have become the criminals, and so the Italians who voted for Salvini (and the Right) can sleep easy in their beds. But this discussion would take too long and deserves a separate discussion. Here we only want to highlight a “gem” of Salvini’s thinking which gives an idea of how we will end up if certain statements are actively followed up within the “vile body” of the Italian working class. The highlight of his speech was what he said about the problem of the world of work and, more precisely, on the so-called “Dignity Decree”, where he blatantly contradicted Di Maio, the other deputy Prime Minister, who, like Salvini, is part of a weak, cowardly and wordy government, very careful to serve, not the interests of Italians, but the needs of capital. OK, he means Italian capitalists, but these are not the overwhelming majority of voters who Salvini declares he wants to defend “above all” from waves of migration, and then from poverty and job insecurity. Salvini – saviour of everything and everyone, or almost – had no difficulty speaking out against one of the promises he and his colleagues had made to the 5-star Movement: “I understand that Di Maio wants to counter precariousness, but we must not damage companies and workers who are forced into the ‘black’ economy because there are too many constraints and costs”. No other sentence could have been more effective in reassuring the assembly of representatives of capital, above all businesses, which have suffered most in the storm of the economic crisis in terms of competitiveness, productivity and bankruptcies. Here is the recipe, regardless of all previous promises. Insecurity is a bad thing: for those who work it is a sword of Damocles which very often falls on the head of the working class. Still, if it is necessary for capital, it must be welcomed, with all due respect to everyone, even those who believed Renzi when he said future contracts would favour new kinds of jobs. Salvini (he who is “anti-system”) has at least been more honest and explicit: precarity is a fixed point that cannot be touched, otherwise it would cause companies too much pain. It’s better that those who work bear the pain, especially as they are used to it already. The government programme also contains a series of undeclared but well-defined immediate objectives, ranging from continuing with the abolition of Article 18, and the Jobs Act to a reform of the Fornero Law(3) which they will change in form but not content. These reforms enacted by their notorious enemy Renzi, will be left in place without even a “thank you” to those who, like him, who have worked to keep the fragile Italian capitalist structure afloat, as always making workers bear the burden, bewildering them with ridiculous promises as incredible as they are impracticable in the current crisis conditions of international capitalism. The last elections, both local and national, witnessed a further flight of working class votes, from the remnants of the Democratic Party [PD], towards the sirens of the League. This flight took place, as the League’s new Mayor of Pisa said, because the PD has turned its back on the workers (true), while the League will defend its interests (a false and fraudulent claim). At the end of this brief commentary on the utterances of the “minister from hell”, it is worth warning those who have rightly penalised the PD for its manifest betrayal of the most elementary policies to defend the Italian working class which, moreover, date back to a time when Renzi had not yet been born. The League in government will be even worse, both in terms of policies over the reception of migrants, and also in terms of labour laws that will go beyond the acceptance of precarious working conditions as a necessary “evil”. On this, we should also note the statement by the Minister of Labour (from the 5 Star Movement) Di Maio who wanted to clarify that “I am the Minister of Labour and not the workers, so I have to look after business”. He then went on to say that, “the workers themselves are, in their small way, entrepreneurs”. It’s clear we are in the hands of the cat and the fox, without being able to recognise which of the two is the fox. The warning for the working class must be stop voting for either capitalist option in the illusion that they will keep their promises. The only promises that will be maintained are those that will support a fragile Italian capitalism whilst for workers there will just be the usual rip-offs accompanied by tears and blood. The supposed leap from Renzi to Salvini is just like pretending that either of these servants of capital can support the interests of those who are exploited to the maximum to support the increasingly urgent needs of a capitalism in a crisis of profitability. After all, Salvini and Di Maio have “the honour” of helping to undermine the class struggle which otherwise could have filled the streets if there had not been a political force “able to stem and channel the discontent of the overwhelming majority of Italians” within an institutional framework. Here a warning, for what its worth, not for Salvini and Di Maio, but for those workers who voted for them: the class struggle is not fought in the polls. The class struggle is not about choosing the least unpleasant or believing the fairytales of the capitalism’s travelling salesmen. The class struggle only becomes such if it breaks with the mechanisms of social management of the capitalist class, and turns against exploitation, against capital and its exploitative relationship with the work force. Otherwise governments and politicians change in a whirlwind of elections in which those who win get bigger, but capital always remains in place, and it is always the same monster that voraciously extorts surplus value, while the working class remains the eternal victim that produces it. (1. )The Italian original title of this article was a play on Salvini’s name “Si Salvi(ni) chi puo” which can be translated as “Every man for himself” but the pun is lost in translation. (2. )This is a long running scandal which brought down the founder of the Northern League Umberto Bossi. His successors have since repositioned the party from being a regionalist separatist organisation to a more traditional racist one closer to the Front National in France. Under Salvini they have dropped the “Northern” in order to widen their appeal. As it is they still got few votes in the South of Italy but the coalition with the Five Star Movement (who got 32% in the last election, mainly in the South, and should be the dominant partner in the coalition) allows them to portray themselves as an all Italian party despite the fact that Salvini is on record of thinking that all Southerners are “scum”. (3. )Article 18 of the Italian constitution protected workers from unfair dismissal, whilst the Jobs Act was brought in by the Renzi Government to remove some of the previous protections on contracts. The 2012 law, named after Elsa Fornero, then labour minister, shifted workers to a defined contribution scheme, stopped indexing pensions above a certain income level for inflation and increased the retirement age to 67. The aim was to raise cash and reassure markets of the commitment to spending discipline in the eurozone’s third-largest economy. All worsened the conditions of workers in relation to capital.